FORT LAUDERDALE, Fla. (CNS) — New medical directives governing health care partnerships and revisions to the charter on the protection of young people were approved during the U.S. Conference of Catholic Bishops’ spring general assembly. During their June 13-14 meeting, the bishops also approved what is described a “pastoral response” to Asian and Pacific Island Catholics and, after a long discussion, they decided to supplement their quadrennial document on Catholic participation in public life with a short letter, a video and other supplementary materials. The meeting opened with a statement decrying Attorney General Jeff Sessions’ decision that asylum seekers fleeing domestic or gang violence cannot find protection in the United States. Just after opening prayer, Cardinal Daniel N. DiNardo of Galveston-Houston, USCCB president, read the statement from the dais, and the bishops voiced their support. The bishops voted 183-2 with two abstentions to revise ethical and religious directives governing key moral questions when Catholic and non-Catholic institutions are preparing to cooperate or merge. Under development since 2015, the changes are limited to Part 6 of the “Ethical and Religious Directives for Catholic Health Care Services” developed by the U.S. Conference of Catholic Bishops. 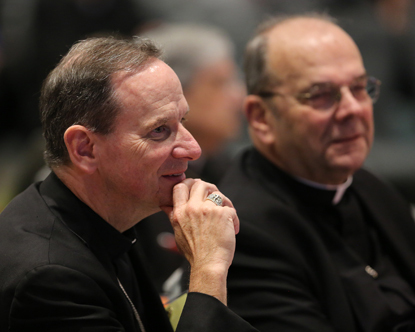 Bishop Robert J. McManus of Worcester, Massachusetts, chairman of the bishops’ Committee on Doctrine’s Subcommittee on Health Care, told the assembly the new directives will help bishops decide whether a health care partnership can occur under the church’s moral teaching. The revisions offer more specific guidance to health care administrators confronted with an increasingly complicated business environment and widespread consolidation within the industry. The bishops also approved changes in language to clarify several articles of the “Charter for the Protection of Children and Young People.” The changes are the first since 2011 as the work to update the document took several years longer than planned to wind through the review process established by the bishops. The vote was 185-5 with one abstention to enact the changes. Bishop Timothy L. Doherty of Lafayette, Indiana, chairman of the Committee for the Protection of Children and Young People, presented the changes, saying the they will strengthen protections for young people. A provision changing the review of the charter from every two years to seven years was among the approved changes. The changes generally tighten requirements for all individuals working with children and add wording to individual articles of the charter or clarify terms used in the document. In the lead up to the vote, Francesco Cesareo, chairman of the National Review Board, cautioned the bishops to guard against complacency in carrying out the charter’s requirements. He urged them to “never waver” in their commitment to protect minors and vulnerable adults from sexual abuse. Cesareo said signs of complacency surfaced in some dioceses and eparchies as auditors compiled an annual report on compliance with the charter during the period July 1, 2016-June 30, 2017. While progress is being made as the number of allegations during the period declined from the two previous years, he cautioned the bishops to remain vigilant. “Despite the progress we have made in the church and the ongoing efforts of dioceses, many among the faithful and in society at large question the commitment of the church, and, in particular the bishops, in addressing the sexual abuse of children,” he told the assembly. 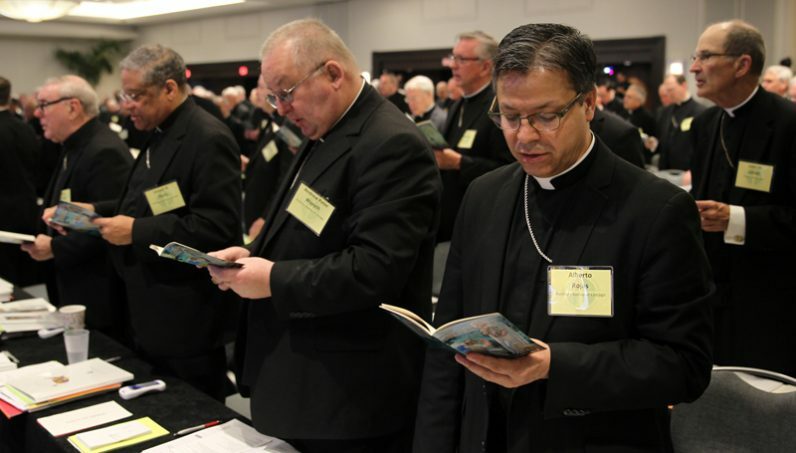 In another vote, the bishops accepted a new document focused on guiding the American church in addressing the pastoral needs of Asian and Pacific Island Catholics. Adopted 187-2 with two abstentions, “Encountering Christ in Harmony” is meant to provide support and offer ideas for ministry to the nation’s nearly 3 million Asian and Pacific Island Catholics. Bishop Oscar A. Solis of Salt Lake City, chairman of the bishops’ Subcommittee for Asian and Pacific Islander Affairs, told the assembly the document addresses the fastest growing minority community in the United States church. The document has been in the works for more than two years. The bishops engaged in an 85-minute discussion before agreeing to develop new supplementary materials and a video to complement its long-standing document guiding Catholic participation in public life. The document traditionally has been updated and released about a year before the presidential election every four years with its last update in 2015. The new materials are expected to be completed in time for the bishops to approve them at their November 2019 general assembly. The bishops heard a planned pastoral letter addressing racism is on schedule for a November vote during the bishops fall meeting. Bishop Sheldon J. Fabre of Houma-Thibodaux, Louisiana, chairman of the bishop’s Ad Hoc Committee Against Racism, said the pastoral letter is on schedule for a November vote when the bishops reconvene in Baltimore. He said drafts of the document have been reviewed by various parties and that their suggestions have been incorporated into it. The document will focus on contemporary concerns affecting Native Americans and African-Americans and the “targeting” of Hispanics with racist language and actions, he said. The pastoral letter will be rooted in the clear message of Micah 6:8, which calls on the faithful “to act justly and to love mercy and to walk humbly with your God,” he added. On the religious freedom front, Archbishop Joseph E. Kurtz of Louisville, Kentucky, chairman of the bishops’ Committee for Religious Freedom, said challenges to religious liberty continue to emerge and the U.S. Catholic Church will remain steadfast in addressing them to serve the common good. The effort will include “choosing our language carefully” through the use of “inspiring and relatable language that promotes the “gift” of religious freedom, he said. He used the example of faith-based agencies that face the threat of government shutdown because of their religious or moral convictions. The committee’s next action was to focus on Religious Freedom Week, set for June 22-29. Archbishop Kurtz said a series of eight videos examining various issues related to the free practice of faith were planned to be released for the week. Its theme is “Serving Others in God’s Love,” and Catholics were being encouraged to pray and act in support of religious freedom in the U.S. and elsewhere during the week. The bishop shown at the meeting in Ft Lauderdale is Most Reverend Joseph Perry, Chicago not Most Reverend J. Terry Steib, SVD, Retired, Memphis, TN. I strongly agree with Bishop Cesareo of the need to guard against complacency regarding the Protection of Children and Young People. The beginning of that complacency was approving a provision to review the charter every 7 years rather than every 2 years. Abuse can occur at any time and every organization must remain vigilant and in the forefront of affording all necessary protections. Laws and practices for preventing and treating child abuse are always evolving and the charter should reflect it. That may be difficult and problematic when only reviewing the charter every 7 years. Did they talk about Christianity? Discrimination applies to all races. There is mounting evidence that white males are being treated unfairly and should not be forgotten. If only all races would heed MLK’S wishes about character .